iTunes is a media player, an online broadcaster, and device manager developed exclusively as a management application for Apple devices. It manages a library that includes music, videos, TV shows, apps, etc. from your Apple device or contains media folders from your PC otherwise. It is known for a broad range of services it offers such as Apple music, Genius Mixes, podcasting, and app store. iTunes keeps track of your playlists, synchronized data and content in a library file. Sometimes, it so happens that after a recent update or changes, the iTunes library disappears and cannot be found. It occurs commonly in Mac or Windows and sometimes in other Apple devices. This happens because the iTunes library file created by the newer updated version is crashed or cannot be read. It also occurs if the disk is locked or permission is denied or if the file is not created in iTunes library. 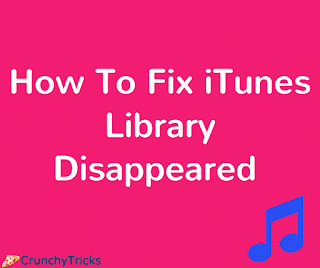 In this article, fixing this iTunes library disappearance is explained and resolved. Now find a file named iTunes Library.itl and draw the file to your desktop. If you can't locate the file then, open iTunes>Edit>Preferences>Advanced Preferences. In this section, you find an option “iTunes Media Folder Location,” go to the particular folder and select the library file. After that go back to your iTunes folder and locate the file “iTunes Library” followed by YYYY-MM-DD. Now choose the file which is most recent, i.e., the date when you updated the iTunes software. Note that any changes or files added to iTunes after this date might not be retrieved as it only contains files added/modified before that date. Click on that file, then press CMD+C for Mac or Ctrl+C on Windows. Copy the file to the iTunes folder and rename it as “iTunes.itl”. Now hold the shift key and open iTunes, the program would ask you to choose the library file. Select the renamed file and bingo! The disappeared files are restored back. Once it is done, delete the file you’d previously drawn to the desktop. Any new changes made in the media library is saved to this library file. So I hope the above solution works for you. Feel free to comment below for any kind of inconvenience related to this issue.